The study, published in Genome Research, follows the results of a hackathon hosted by the University of Notre Dame, the H3Africa Bioinformatics Network and IBM Research Africa in Johannesburg, South Africa. The week-long event pulled together a group of 23 researchers from eight African countries to analyze unpublished data of several isolates of the human malaria parasite Plasmodium falciparum. The hackathon participants were asked to assess the potential of using this information to predict the parasite’s ability to develop drug resistance to artemisinin, a preferred treatment for malaria. 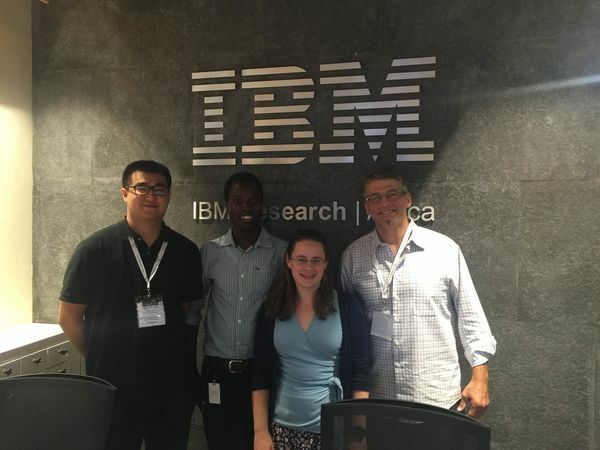 Notre Dame researchers Sage Davis, Geoffrey Siwo, Katie Button-Simons and Professor Michael Ferdig at the hackathon in Johannesburg, South Africa. The data used for the event were provided by Michael Ferdig, professor of biological sciences at Notre Dame and affiliated member of the EIGH, and his lab. These data were unpublished and opened up to unbiased assessment of the study design and of the data, which is uncommon. Hackathon participants began their research in an unexpected place – by questioning the quality of it. This resulted in a cleanup of the raw data and the identification of study outliers. In addition to improving quality of the data, the hackathon also allowed researchers across multiple disciplines – like genomics, modeling and microarray data analysis – to work together. Researchers with little to no understanding of malaria were given a crash course on the disease, providing those with different backgrounds and varying perspectives to come up with diverse models that could be used for future research. In addition to Ferdig and Siwo, co-authors from Notre Dame and the Eck Institute for Global Health include Katrina A. Button-Simons, postdoctoral researcher of biological sciences, and Sage Zenon Davis, graduate student of biological sciences. Other collaborators for this study enabled by a grant from the National Institutes of Health to the Ferdig lab and the H3Africa Bioinformatics Network funded by National Human Genome Research Institute include Jean-Baka Domelevo Entfellner of the University of Western Cape, Amel Ghouila of the Institut Pasteur de Tunis, Nicola Mulder of the University of Cape Town and Sumir Panji of the University of Cape Town. The Eck Institute for Global Health at the University of Notre Dame endeavors to promote research, training and service for the advancement of health standards for all people. The institute recognizes health as a fundamental human right and aims to support those in developing countries who are disproportionately impacted by preventable diseases. To learn more about the institute, visit globalhealth.nd.edu. Originally published by Brandi Klingerman at research.nd.edu on July 23, 2018.